One Year Later:"My, has that Santolina grown!" The newly planted Santolinas (Lavender Cotton) were petite 1-gallon plants two years ago, but look at them now! The "checkerboard" planting scheme was one that we highlighted on the garden makeover show, "Garden Police," that I co-hosted for Discovery. These Mediterranean natives do well in Sunset zones 2-24 and grow about 2 feet tall and three feet wide as you can see in the second photo. I'm glad we gave them plenty of room to grow because the Santolinas filled in beautifully and have a soft "frothy" and airy look now. Both the gray and green Santolina incana sport bright yellow flower heads. To keep Santolina from becoming too woody, cut it back yearly before spring growth begins. Enjoy the scent and don't be afraid to experiment with whimsical patterns like this checkerboard design! Thanks for visiting and for commenting. I’m not a huge fan of “painted” landscapes but I’m willing to see how it looks! 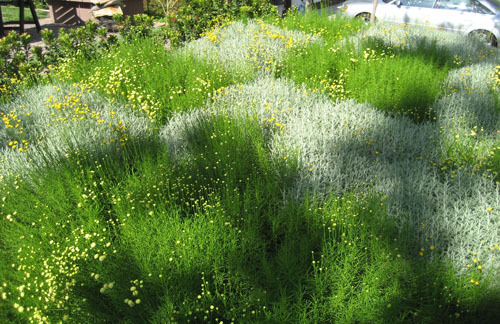 Santolina is a very easy care plant with a big payoff! I can’t wait to see more of your container creations Anna! I posted this on my blog cause I liked it so much. Hey, This is fantastic!!! I planted the green Lavender Cotton and it smelled so good. Didn’t know there was a grey version. The blending of the two looks so pretty.